Topshop size 12 red corduroy mini skirt. Condition is New with tags. Dispatched with Royal Mail 1st Class. Topshop blue denim moto mini-skirt size 4. Condition is Used. Dispatched with Royal Mail 1st Class. 44% viscose, 29% polyester 27%cotton states to be dry cleaned. White Topshop Mini Skirt Size 8 Great condition hardly worn Send offers! TopShop Leopard Print Mini Skirt Lined Brushed Fabric Size 8. Condition is used. Ladies size 8 Denim blue skirt from Top Shop. Selling as Used but still in very good condition, please see other items I am selling, happy to combine postage. Dispatched with Royal Mail 2nd Class. Women's Topshop silver sequin mini skirt size 8. Condition in used, worn once. A super little skirt with lots of fullness given by the frills and netting. Length 11.5". Yellow And Green Topshop tartan mini skirt. Dispatched with Royal Mail 1st Class. TOPSHOP. Red Denim Mini Skirt. Size 6 good condition selling as no longer fits . Condition is Used. Dispatched with Royal Mail 2nd Class. Petite Topshop Moto Black Denim Mini Skirt Womens Size 6 Button Up pockets. Condition is Used. Dispatched with Royal Mail 2nd Class. 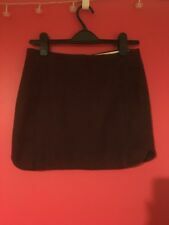 Ladies Topshop Black Popper Down A-Line Cord Skirt UK Size 12. Condition is Used. Skirt measures 16in length. Waistband measures 15in. Topshop Crochet White Mini Skirt 8. Rsally good condition. Fully lined. Perfect for the summer. Condition is Used. Dispatched with Royal Mail 1st Class. Lovely White Lace Effect Patterned Skirt. Flare Mini Skirt Style. This skirt is fully lined. Cotton blend material. Womens Black Mini Denim Skirt Embroided Topshop Size 6. Dispatched with Royal Mail 2nd Class Signed For. Topshop Floral A Line Midi Skirt 10/12 Side Zip. Condition is Used. Dispatched with Royal Mail 2nd Class. Topshop size 12 black Bandage mini skirt machine washable. Topshop size 12 black Bandage mini skirt machine washable. There are a couple of loose threads. Used but great condition. Comes from a smoke free home. Returns are not accepted. Will be posted the following working day after payment is received via Royal Mail 2nd class. Ladies Topshop Denim Mini Button Down Skirt Size 12 (W30) Great condition. Condition is Used. Dispatched with Royal Mail 2nd Class. Topshop Black Denim Skirt UK 8. Condition is Used. Dispatched with Royal Mail 2nd Class. Topshop Moto Stripey Denim Skirt W28. Condition is Used. Dispatched with Royal Mail 1st Class. Topshop Print Mini Skirt, Size 8. Worn a number of times but in very good condition. Dispatched with Royal Mail 1st Class. Topshop Silver Metallic Mini Skirt Ladies Size 8. Worn once so perfect condition. Top shop wrap zebra print mini skirt, uk size 6. Worn once! topshop black denim skirt 10. Condition is Used. Dispatched with Royal Mail 2nd Class. 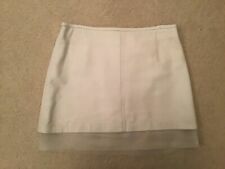 Topshop White Cream Textured Asymmetric Skirt Size 8. Condition is Used. Dispatched with Royal Mail 2nd Class.